Camera read IL Rt 83 sign as 85 MPH sign! Discussion in 'Technical' started by scottf200, Mar 14, 2016. 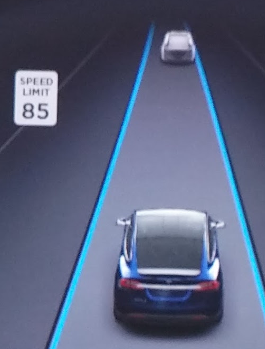 Was driving on IL Route 83 today and noticed my X was displaying an 85 mph sign on the drivers info display. Yikes. This is what the sign look like along that route. I think a better question is why does Illinois make their route signs look identical to a speed limit sign? Indiana's are the same, too. ...as a 50 mph sign. There's some tuning that MobilEye & Tesla need to do, I think. Should figure out a place to submit such incidents as they can maybe enhance the training data. The other night it read a 45 mph sign as a 5 mph speed limit. The "4" was a different material placed over the original number. I noticed at night it did not reflect the same as the 5. Suspect that was the reason why AP read it as 5 mph (not 45). I'll try to get a pic next time that happens. The very same thing happens with me in Noprth Florida while driving on Hwy 20. It's a repeatable experiment. Car immediately slows down from 55 to 20. Less frequently, the speed limit (35 mph) sign on another road is read as 5 MPH. I didn't think the cruise control could work below about 18 MPH, but twice, it has slowed toward 5 MPH before I was able to override the AutoPilot.